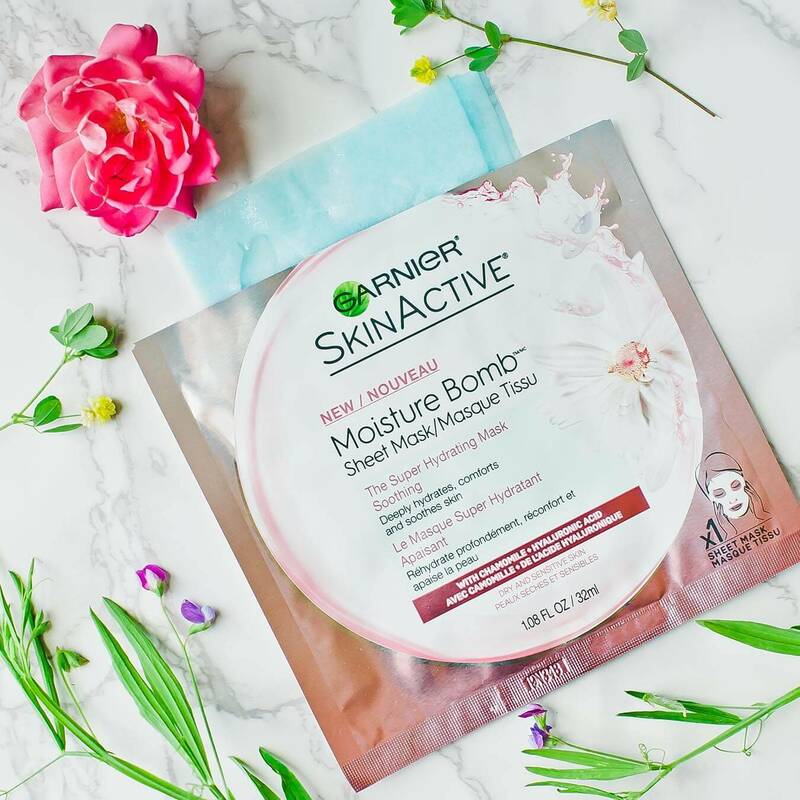 This water-based sheet mask with Hyaluronic Acid, an ingredient naturally found in skin, floods skin with intense, weightless hydration. Free of mineral oil and petrolatum, this non-greasy formula, with chamomile extract, provides a soothing burst of hydration and a fresher, softer, more radiant look. 1. Start with clean skin. Gently press the mask on to the face with the blue side on top. 2. Peel off the blue film. Adjust and smooth out the mask to fit the contours of your face. 4. Remove the mask and gently massage the remaining product into the skin. No need to rinse. Rated 5 out of 5 by Serpentes from LOVE IT This is my rescue must have for the skin! I have combination skin, but no matter which of these masks I use, it really helps my skin to stay rehydrated and calm. I am using this especially after heavy makeup and so on. Rated 1 out of 5 by MeganT27 from Too smelly, burned, overpriced I'm a huge fan of sheet masks and a regular buyer. I noticed these were way pricier than other sheet masks I purchase, but I decided to try them anyway. They have a strong fragrance and after a couple minutes, started to burn my skin (I do not have sensitive skin). Do not recommend, will not purchase again. Rated 5 out of 5 by karlena from Works on combo/acne-prone skin too! I have acne-prone, combination skin, but my skin was abnormally dry whenI was on vacation last week. 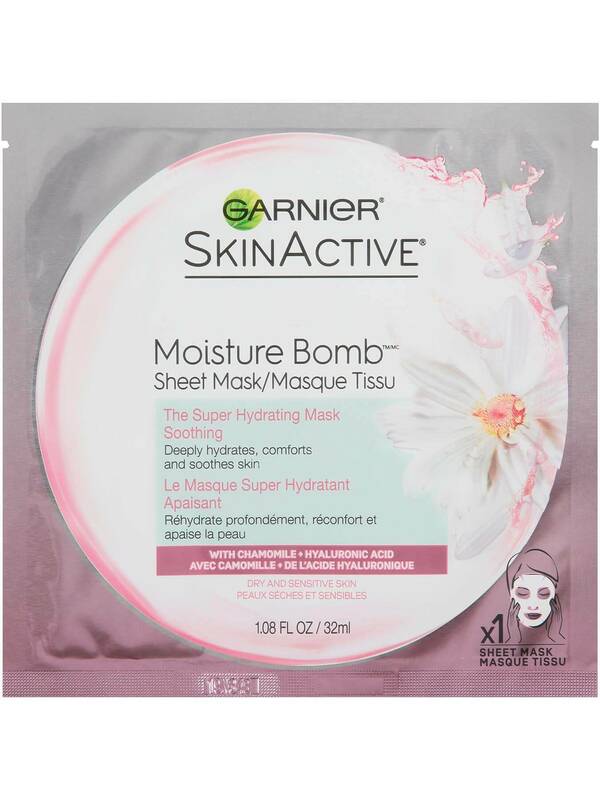 I decided to try out this mask, and it worked wonders on my dry, irritated skin. It calmed down the burning and the redness and quickly returned the moisture in my face -- all without breaking me out at all. If you have acne-prone skin and are skeptical about using a hydrating face mask, I would highly recommend this one. Rated 4 out of 5 by MMNN from Great product! My skin just feels so hydrated after each use, highly recommend it. 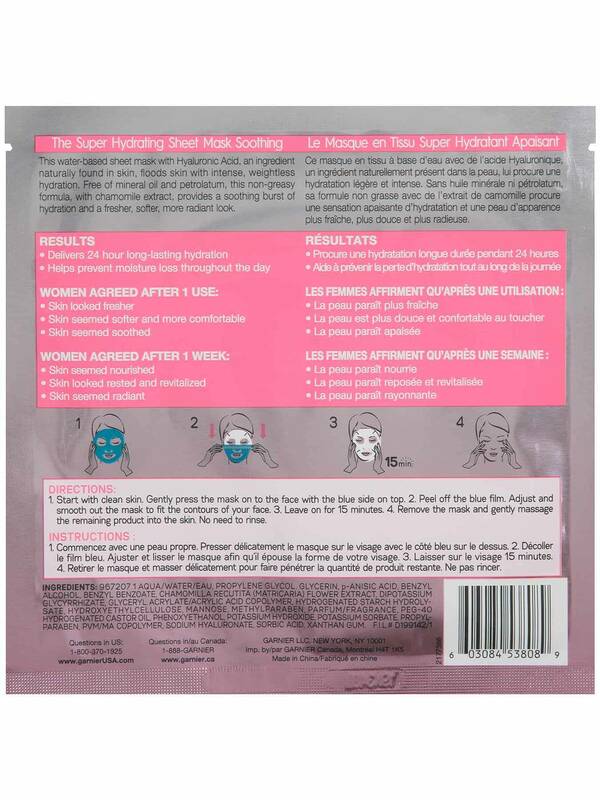 Rated 5 out of 5 by katiemc715 from This has saved my skin during the Retin-A uglies! I recently started using prescription strength Retin-A and it has wreaked havoc on my face. I am typically very oily, but now paired with the oily skin is awful dry patches all around my eyes, mouth, forehead, chin, cheeks, lips, basically everywhere on my face. I stumbled across these at my local pharmacy and had to grab one. I LOVE how much product it has and how cooling/soothing it is. I have tried all different types of moisturizers to help me through the Retin-A uglies, but this has been the most helpful, ESPECIALLY around my mouth and eyes. I exfoliate with a washrag to loosen the dry skin, then use this to moisturize and lock in hydration before bed. This has TRULY been a lifesaver. Sorry for the long review, but with all the wishy-washy reviews I've seen I think this product truly deserves more praises. Thank you, Garnier! Rated 5 out of 5 by Jmdxo from SO BOMB I bought all 3 masks to review and I'm in LOVE with all of them. They are all very promising. The packaging is bomb! I appreciate that all of them offer hydration. After I took off the masks (following my skin care regime) my face feels very REFRESHING AND COOL! My skin looks very well rested. I'm impressed with these masks! !